Home »Alligators » Alligator Pie: A Secret Recipe to Fight Infection? “Alligator pie, alligator pie, If I don’t get some I think I’m gonna die.” As it turns out, this line from the children’s poetry book Alligator Pie by Dennis Lee may have some truth behind it. While no one is suggesting that alligators should become a new food group, researchers have discovered a type of molecule in alligator blood that may help fight infection — a growing problem in modern medicine. Alligators are fascinating reptiles with near supernatural capabilities. The American alligator, Alligator mississippiensis, is notorious for being an especially robust creature that can regenerate lost limbs, grow new teeth, and survive exposed wounds with little to no risk of infection. Researchers like Dr. Barney Bishop, an associate professor in the Department of Chemistry and Biochemistry at George Mason University in Virginia, are captivated by this animal’s ability to avoid infection and are trying to figure out the secret to its immunity. Unlike alligators, humans are very vulnerable to infections, with infectious diseases killing over ten million people each year worldwide. Unfortunately, the spread of infection is even common in medical facilities. According to The Alliance for Aging Research, nearly 99,000 people in the US die from hospital-acquired infections every year. But, with promising research on alligator blood, these numbers could change. So, what’s the secret to an alligator’s ability to deal with infection? Dr. Bishop believes it is something called antimicrobial peptides. A peptide is a biological molecule found in the body that plays a key role in structure, function, and regulation of cells. Antimicrobial peptides are a specific type of peptide that works to kill harmful microorganisms such as bacteria and other microbes that cause infections. These antimicrobial peptides help stimulate the American alligator’s immune system to respond to bacteria and other disease-causing molecules faster and more effectively than the human immune system. Think of antimicrobial peptides as construction workers removing the windows and doors of a house. 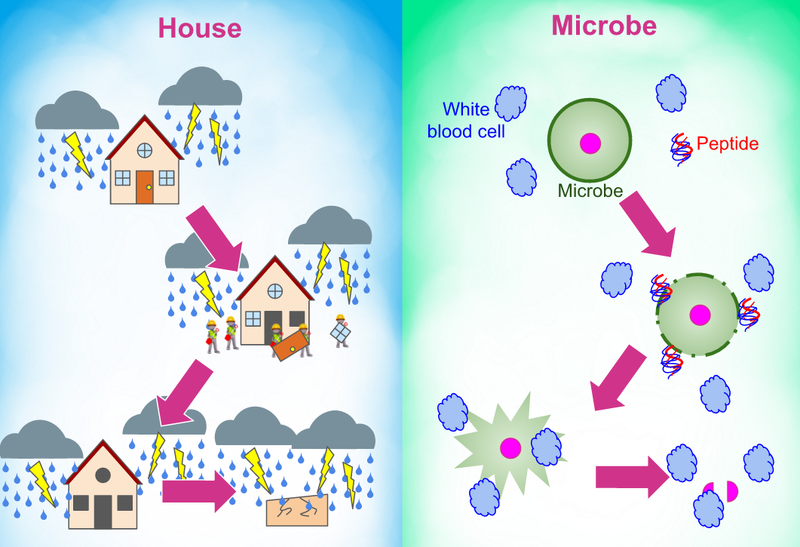 Without any windows or doors, the house, or microbe, is exposed to a thunderstorm-like immune system that can tear it apart. The peptides mimic this by penetrating and destroying the microbe’s membrane: its cellular shield to the immune system. Alligators, lizards, and even some plants have these infection-fighting antimicrobial peptides. Currently, Dr. Bishop is identifying and categorizing new peptides in species that demonstrate immunity to infection and investigating how these peptides work with the immune system. Using bioinformatics, the science of analyzing biological data, he has identified forty-five possible antimicrobial peptides in the American alligator alone. Of these, eight have been chosen for further study. He is excited about his line of research and says, ”We’ve seen a new side to the complexity of immunity and it is fascinating.” The next step for his research is to understand how these peptides would behave and function in the human body and determine whether or not they can help treat human infection. Dr. Bishop’s work towards fully understanding the characteristics of the American alligator’s antimicrobial peptides is just the first step towards a healthier future. Only time will tell if “alligator pie” holds the key to treating infection. L. Van Hoek. “Bioprospecting the American Alligator (Alligator mississippiensis) Host Defense Peptidome.” Plos One 10, no. 2 (February 11, 2015). Accessed August 19, 2016. doi:10.1371/journal.pone.0117394. 3942-951. Accessed August 19, 2016. doi:10.1111/j.1742-4658.2011.08302.x. Heitz, David. “99,000 Americans Die of Healthcare-Aquired Infections Every Year.” Healthline. July 27, 2013. Accessed August 19, 2016. http://www.healthline.com/health-news/aging-healthcare-acquired-infections-kill-nearly-a-hundred-thousand-a-year-072713. “Infectious Diseases: A Persistent Threat.” Smart Global Health. Accessed August 19, 2016. My name is Andrei and I’ve been a writer for cSw for the past three years. I’m currently a junior in high school who is interested in science and technology. Writing for cSw has been an invaluable experience that has allowed me to grow and broaden my scientific knowledge, writing, and communication skills by working with amazingly passionate mentors and researchers. Outside of school, I am interested in developing software, competing in public speaking competitions, and playing volleyball. I hope you enjoyed my article and remember to always be curious! Even though the scientific part of the subject matter, not the subject matter itself, is a bit of a dry subject, Andrei, at his early age, managed to make the subject of disease immunity, as well as possible body parts growth and regeneration, interesting through a children story analogy, making it an easier and more exciting read than otherwise. Way to go! Good article Andrei! I have learned something new today about antimicrobials can come under peptide structure. That would be another approach to be considered for the future of the antibiotic therapies. Thank you for writing about this discovery, I did not come across it. I am looking forward to hear more about this and also about other new discovery in the science. Excellent article, more funds need to be directed to this type of research. Keep up the great work Andrei. It is so wonderful to see young people like you interested in such topics. Keep up the good work you have a bright future. Great article. Easy to read and very interesting. Wow! I really enjoyed reading this article. Your article is extremely well written and thought out! Great job !!! Your topic is very interesting, and well researched. I am looking forward to reading some more of your work! Great read. Very informative. Can’t wait to learn more about this. Great article Andrei! Looking forward to more articles! Congratulation Nice story Is this for real or is your “imagination island”? Wow, I never thought about how important alligators were for our immune system. I wonder if the peptidethe alligators have can be extracted without harming them. I love reptiles especially alligators so I wouldn’t like the idea of them suddenly being hunted down for pie lol Although, I would definitely support the idea of using a blood sample without harming the animal to find out how they fight off infections and how humans can benefit from it. I’m definitely going to stay up to date on this and find out the result. Very interesting and well written article! Great work Andrei! It makes me really proud to see how one of my former students has utilized his wonderful writing skills. Keep up the great work! This article is so worthy of publication and contains the embodiment of creativity, research, and organization. Bravo to Andrei Grovu, he is on his way to something very special. Please include us in all his future endeavors, thank you. This article was so very well written, so informative. Keep up the good work. You have a very bright future ahead of you “Dr. Grovu”. This is a great article that explains one of the many scientific advances that are happening today. What a riveting hook 🙂 I gained a whole new perspective on alligators; you did a job well done! Well written and informative. The natural world will never cease to be a source of wonder, hope and inspiration. What an extraordinary discovery. Congratulations for informing everyone about this. This is a wonderful article an piece of writing. You pulled me right in with alligator pie and then your use of illustrations in conjunction with your helpful analogies made me understand the science so easily. Great topic and a very engaging tone. I found out the interesting thing, clearly and concisely presented. Keep it up. Who would have thought that alligators would yield such an important substance. Great critical thinking skills involved here. Interesting story. A very interesting approach towards biology and medicine. Congrats to the young author for his interest and well written work: informed position, articulated presentation, and tempered position….some ingredients of a future thorough scientist! I absolutely loved reading this article! Starting with the astonishing drawing of the alligator and a pie being flung from its tail to the intro of a children’s poetry book, and ending with its statement “Only time will tell if alligator pie holds the key to treating infection”… I just want to congratulate Andrei Grovu and the team of artists and editors that were a part of this article! I never thought that something such as alligator’s blood can possibly make such a substantial impact in treating infectious diseases. Great article! Loved reading about this topic. Love the writing style of this article! I never knew that alligator’s blood could possibly make such a substantial impact on curing infectious diseases. Amazing insight. A great read!